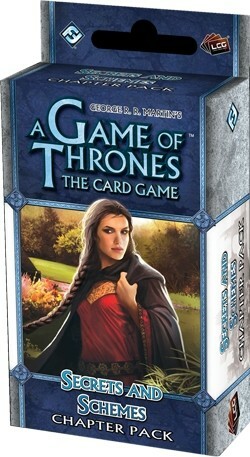 Secrets and Schemes is the first Chapter Pack in the Wardens cycle for A Game of Thrones: The Card Game. In Secrets and Schemes, you will discover sixty new cards (three copies each of twenty different cards) that touch upon the schemes concocted by those patient individuals who have remained above or outside of the wars that have shaken the Seven Kingdoms. Additionally, you'll learn how they make their opening moves with a host of new Knights, attachments, and the agenda, Aloof and Apart (Secrets and Schemes, 18), which encourages players to revisit some of the game's most expensive, powerful, and recognizable characters.